Klaipėda (Lithuanian pronunciation: [ˈkɫɐɪˑpʲeːdɐ], listen (help·info); German: Memel, Samogitian: Klaipieda, Polish: Kłajpeda) is a city in Lithuania on the Baltic Sea coast. It is the third largest city in Lithuania and the capital of Klaipėda County. The city has a complex recorded history, partially due to the combined regional importance of the usually ice-free Port of Klaipėda at the mouth of the Akmena-Danė River. It was controlled by successive German states until the 1919 Treaty of Versailles. As a result of the 1923 Klaipėda Revolt it was annexed by Lithuania and has remained with Lithuania to this day, except for the period between 1939 and 1945 when it returned to Germany following the 1939 German ultimatum to Lithuania and the German–Soviet Union Molotov–Ribbentrop Pact. The population has shrunk from the city to suburbs and the hinterland. The city had a population of 207,100 in 1992 to 157,350 in 2014 but the city is growing again. Popular seaside resorts found close to Klaipėda are Nida to the south on the Curonian Spit and Palanga to the north. The Teutonic Knights built a castle in the *Pilsāts Land of the Curonians and named it Memelburg; later the name was shortened to Memel. From 1252 to 1923 and from 1939 to 1945, the town and city were officially named Memel. Between 1923 and 1939, both names were in official use; since 1945 the Lithuanian name of Klaipėda has been used. The names Memelburg and Memel are found in most written sources from the 13th century onwards, while Klaipėda is found in Lithuania-related sources since the 15th century. The first time the city was mentioned as Caloypede in the letter of Vytautas in 1413, for the second time in the negotiation documents of 1420 as Klawppeda, and for the third time in the Treaty of Melno of 1422 as Cleupeda. According to Samogitian folk etymology, the name Klaipėda refers to the boggy terrain of the town (klaidyti=obstruct and pėda=foot). Most likely the name is of Curonian origin and means "even ground": "klais/klait" (flat, open, free) and "ped" (sole of the foot, ground). The lower reaches of the Neman River were named either *Mēmele or *Mēmela by Scalovians and local Curonian inhabitants. In the Latvian Curonian language it means mute, silent (memelis, mimelis, mēms). This name was adopted by speakers of German and also chosen for the new city founded further away at the lagoon. Klaipėda city seal, 1446 (diameter 200 mm (7.9 in)). From the Archive of the Prussian Cultural Heritage Foundation, Berlin. The coat of arms of Klaipėda is also used as coat of arms of Klaipėda city municipality. The modern version was created by the designer Kęstutis Mickevičius. The modern coat of arms was created by restoring old seals of the Memel city (analogous with those used in the years 1446, 1605 and 1618). It was affirmed on 1 July 1992. 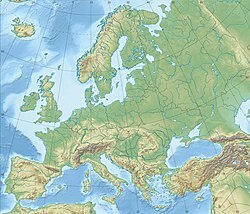 A settlement of Baltic tribes in the territory of the present-day city is said to have existed in the region as early as the 7th century. In the 1240s the Pope offered King Håkon IV of Norway the opportunity to conquer the peninsula of Sambia. However, following the personal acceptance of Christianity by Grand Duke Mindaugas of Lithuania, the Teutonic Knights and a group of crusaders from Lübeck moved into Sambia, founding unopposed a fort in 1252 recorded as Memele castrum (or Memelburg, "Memel Castle"). The fort's construction was completed in 1253 and Memel was garrisoned with troops of the Teutonic Order, administered by Deutschmeister Eberhard von Seyne. Documents for its foundation were signed by Eberhard and Bishop Heinrich von Lützelburg of Courland on 29 July 1252 and 1 August 1252. Master Conrad von Thierberg used the fortress as a base for further campaigns along the Neman River and against Samogitia. Memel was unsuccessfully besieged by Sambians in 1255, and the scattered Sambians submitted by 1259. Memel was colonized by settlers from Holstein, Lübeck and Dortmund, hence Memel also being known at the time as Neu-Dortmund, or "New Dortmund". It became the main town of the Diocese of Curonia, with a cathedral and at least two parochial churches, but the development of the castle became the dominant priority. According to different sources, Memel received Lübeck city rights in 1254 or 1258. In the spring and summer of 1323, a Lithuanian army led by Gediminas came up the Neman and laid siege to the castle of Memel after conquering the town, and devastated Sambia, forcing the Order to sue for a truce in October. During the planning of a campaign against Samogitia, Memel's garrison of the Teutonic Order's Livonian branch was replaced with knights from the Prussian branch in 1328. Threats and attacks by Lithuanians greatly thwarted the town's development; the town and the castle were both sacked by Lithuanian tribes in 1379, while Samogitians attacked 800 workers rebuilding Memel in 1389. The Treaty of Melno in 1422 stabilized the border between the Teutonic Order and the Grand Duchy of Lithuania for the next 501 years. The rebuilt town received Kulm law city rights in 1475. Memel remained part of what became Prussia and Germany; the border to Lithuania remained unchanged until 1919. It was one of the longest-lasting borders in Europe, and is referred to in the now-unsung first verse of the German national anthem, which describes borders of German-speaking lands: Von der Maas bis an die Memel, referring to the Meuse river in the West and Neman river in the East. Against the wishes of its governor and commander, Eric of Brunswick-Wolfenbüttel, Memel adopted Lutheranism after the conversion of Hohenzollern Margrave of Brandenburg Albert of Prussia and the creation of the Duchy of Prussia as a fief of Poland in 1525. It was the onset of a long period of prosperity for the city and port. It served as a port for neighbouring Lithuania, benefiting from its location near the mouth of the Neman, with wheat as a profitable export. The Duchy of Prussia was inherited by a relative, John Sigismund, the Hohenzollern prince-electors of the March of Brandenburg in 1618. Brandenburg-Prussia began active participation in regional policy, which affected the development of Memel. From 1629–1635, the town was occupied by Sweden over several periods during the Polish-Swedish War of 1625–1629 and the Thirty Years' War. After the Treaty of Königsberg in 1656 during the Northern Wars, Elector Frederick William opened Memel's harbor to Sweden, with whom the harbor's revenue was divided. Prussian independence from Poland and Sweden was affirmed in the Treaty of Oliva in 1660. The construction of a defence system around the entire town, initiated in 1627, noticeably changed its status and prospects. In November 1678 a small Swedish army invaded Prussian territory, but was unable to capture the fortress of Memel. Timber frame buildings in the centre of Klaipėda. By the beginning of the 18th century, Memel was one of the strongest fortresses (Memelfestung) in Prussia, and the town became part of the Kingdom of Prussia in 1701. Despite its fortifications, it was captured by Russian troops during the Seven Years' War in 1757. Consequently, from 1757–1762 the town, along with the rest of eastern Prussia, was dependent on the Russian Empire. After this war ended, the maintenance of the fortress was neglected, but the town's growth continued. Memel became part of the province of East Prussia within the Kingdom of Prussia in 1773. In the second half of the 18th century Memel's lax customs and Riga's high duties enticed English traders, who established the first industrial sawmills in the town. In 1784, 996 ships arrived in Memel, 500 of which were English. (In 1900 there was still an active English church in Memel, as well as a "British Hotel"). The specialisation in wood manufacturing guaranteed Memel's merchants income and stability for more than a hundred years. During this era it also normalised its trade relations with Königsberg; regional instability had degraded relations since the 16th century. Memel prospered during the second half of the 18th century by exporting timber to Great Britain for use by the Royal Navy. In 1792, 756 British ships visited the town to transport lumber from the Lithuanian forests near Memel. In 1800 its imports consisted chiefly of salt, iron and herrings; the exports, which greatly exceeded the imports, were corn, hemp, flax, and, particularly, timber. The 1815 Encyclopædia Britannica stated that Memel was "provided with the finest harbour in the Baltic". During the Napoleonic Wars, Memel became the temporary capital of the Kingdom of Prussia. Between 1807 and 1808, the town was the residence of King Frederick William III, his consort Louise, his court, and the government. On 9 October 1807 the king signed a document in Memel, later called the October Edict, which abolished serfdom in Prussia. It originated the reforms of Karl Freiherr vom und zum Stein and Karl August von Hardenberg. The land around Memel suffered major economic setbacks under Napoleon Bonaparte's Continental System. During Napoleon's retreat from Moscow after the failed invasion of Russia in 1812, General Yorck refused Marshal MacDonald's orders to fortify Memel at Prussia's expense. After the unification of Germany into the German Empire in 1871, Memel had the distinction of being Germany's northernmost city. The development of the town in the 19th century was influenced by the industrial revolution in Prussia and the attendant processes of urbanisation. Even though the population of Memel increased fourfold during the 19th century, and had risen to 21,470 by 1910, its pace of development lagged in comparison. The reasons for this were mostly political. Memel was the northernmost and easternmost city in Germany, and although the government was engaged in a very costly tree-planting exercise to stabilise the sand-dunes on the Curonian Spit, most of the financial infusions in the province of East Prussia were concentrated in Königsberg, the capital of the province. Some notable instances of the German infrastructure investments in the area included sandbar blasting and a new ship canal between Pillau and Königsberg, which enabled vessels of up to 6.5 m draughts to moor alongside the city, at a cost of 13 million marks. Owing to the absence of heavy industry in the 1870s and 1880s, the population of Memel stagnated, although wood manufacturing persisted as the main industry. It remained the central point of the Baltic timber-trade. A British Consul was located in the town in 1800; in 1900 a British Vice-Consul was recorded there, as well as a Lloyd's Agent. A narrow gauge railway station in 1920. By 1900 steamer services had been established between Memel and Cranz (on the southern end of the Curonian Spit), and also between Memel and Tilsit. A main-line railway was built from Insterburg, the main East Prussian railway junction, to St. Petersburg via Eydtkuhnen, the Prussian frontier station. The Memel line also ran from Insterburg via Tilsit, where a further direct line connected with Königsberg, that crossed the 4 kilometres (2 miles) wide Memel River Valley over three bridges before its arrival in Memel. During the second half of the 19th century, Memel was a center for the publication of books printed in the Lithuanian language using a Latin-script alphabet – these publications were prohibited in the nearby Russian Empire of which Lithuania was a province. The books were then smuggled over the Lithuanian border. The German 1910 census lists the Memel Territory population as 149,766, of whom 67,345 declared Lithuanian to be their first language. The Germans greatly predominated in the town and port of Memel as well as in other nearby villages; the Lithuanian population was predominant in the area's rural districts. Under the Treaty of Versailles after World War I, Klaipėda and the surrounding Klaipėda Region (Memel Territory) were detached from Germany and made a protectorate of the Entente States. The French became provisional administrators of the region until a more permanent solution could be worked out. Both Lithuania and Poland campaigned for their rights in the region. However, it seemed that the region would become a free city, similar to the Free City of Danzig. Not waiting for an unfavorable decision, the Lithuanians decided to stage the Klaipėda Revolt, take the region by force, and present the Entente with a fait accompli. The revolt was carried out in January 1923 while western Europe was distracted by the occupation of the Ruhr. The Germans tacitly supported the action, while the French offered only limited resistance. The League of Nations protested the revolt, but accepted the transfer in February 1923. The formal Klaipėda Convention was signed in Paris on 8 May 1924, securing extensive autonomy for the region. The annexation of the city had enormous consequences for the Lithuanian economy and foreign relations. The region subsequently accounted for up to 30% of the Lithuania's entire production. Between 70% and 80% of foreign trade passed through Klaipėda. The region, which represented only about 5% of Lithuania's territory, contained a third of its industry. Weimar Germany, under Foreign Minister Gustav Stresemann, maintained normal relations with Lithuania. However, Nazi Germany desired to reacquire the region and tensions rose. Pro-German parties won clear supermajorities in all elections to the Klaipėda Parliament, which often clashed with the Lithuanian-appointed Klaipėda Directorate. Lithuanian efforts to "re-Lithuanize" Prussian Lithuanians by promoting Lithuanian language, culture, education were often met with resistance from the locals. In 1932, a conflict between the Parliament and the Directorate had to be resolved by the Permanent Court of International Justice. In 1934–1935, the Lithuanians attempted to combat increasing Nazi influence in the region by arresting and prosecuting over 120 Nazi activists for the alleged plot to organize an anti-Lithuanian rebellion. Despite rather harsh sentences, the defendants in the so-called Neumann–Sass case were soon released under pressure from Nazi Germany. The extensive autonomy guaranteed by the Klaipėda Convention prevented Lithuania from blocking the growing pro-German attitudes in the region. As tensions in pre-war Europe continued to grow, it was expected that Germany would make a move against Lithuania to reacquire the region. German Foreign Minister Joachim von Ribbentrop delivered an ultimatum to the Lithuanian Foreign Minister on 20 March 1939, demanding the surrender of Klaipėda. Lithuania, unable to secure international support for its cause, submitted to the ultimatum and, in exchange for the right to use the new harbour facilities as a Free Port, ceded the disputed region to Germany in the late evening of 22 March 1939. Adolf Hitler visited the harbour and delivered a speech to the city residents. This was Hitler's last territorial acquisition prior to World War II. During World War II, from the end of 1944 into 1945, as Allied victory appeared imminent, the inhabitants fled as the fighting drew nearer. The nearly empty city was captured by the Soviet Red Army on 28 January 1945 with only about 50 remaining people. After the war the Memel Territory was incorporated into the Lithuanian SSR, marking the start of a new epoch in the history of the city, and the end of the city's belonging to the German speaking lands. The Soviets transformed Klaipėda, the foremost ice-free port in the Eastern Baltic, into the largest piscatorial-marine base in the European USSR. A gigantic shipyard, dockyards, and a fishing port were constructed. Subsequently, by the end of 1959, the population of the city had doubled its pre-war population, and by 1989 there were 203,000 inhabitants. In the aftermath of World War II almost all the new residents came to Klaipėda from Lithuania, Russia, Belarus and Ukraine. Initially the Russian-speakers dominated local government in the city, but after the death of Joseph Stalin, more people came to the city from the rest of Lithuania than from other Soviet republics and oblasts; Lithuanians then became its major ethnic group. Among Lithuanian cities with a population greater than 100,000, however, Klaipėda has the highest percentage of people whose native language is Russian. Until the 1970s, Klaipėda was only important to the USSR for its economy, while cultural and religious activity was minimal and restricted. The developers of a Roman Catholic church (Maria, Queen of Peace, constructed 1957–1962) were arrested. The city began to develop cultural activities in the 1970s and 1980s, such as the introduction of the Sea Festival cultural tradition, where thousands of people come to celebrate from all over the country. Based on the Pedagogical University of Šiauliai and the National Conservatory of Lithuania in Klaipėda, the University of Klaipėda was established in 1991. Klaipėda is now the home of a bilingual German-Lithuanian institution, the Hermann-Sudermann-Schule, as well as an English-language University, LCC International University. In 2014 Klaipėda was visited 64 times by cruise ships, surpassing the Latvian capital, Riga, for the first time. 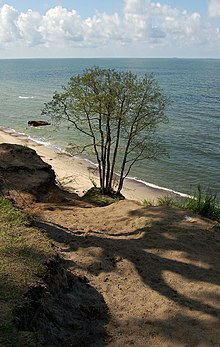 While today the Kursenieki, also known as Kuršininkai are a nearly extinct Baltic ethnic group living along the Curonian Spit, in 1649 Kuršininkai settlement spanned from Memel (Klaipėda) to Danzig (Gdańsk). The Kuršininkai were eventually assimilated by the Germans, except along the Curonian Spit where some still live. The Kuršininkai were considered Latvians until after World War I when Latvia gained independence from the Russian Empire, a consideration based on linguistic arguments. This was the rationale for Latvian claims over the Curonian Spit, Memel, and other territories of East Prussia which would be later dropped. As of 2017[update], the population was 172,272. Citizens by gender: female - 53,58%, male - 46,42%. Klaipėda city municipality council is the governing body of the Klaipėda city municipality. It is responsible for municipal laws. The council is composed of 31 members (30 councillors and a mayor) directly elected for four-year terms. Klaipėda's climate is humid continental (Köppen Dfb) but quite close to being oceanic (Köppen Cfb). In July and August, the warmest season, high temperatures average 20 °C (68 °F), and low temperatures average 14 °C (57 °F). The highest official temperature ever recorded was 36.6 °C (97.9 °F) in August 2014. In January and February, the coldest season, high temperatures average 0 °C (32 °F) with low temperatures averaging −5 °C (23 °F). The coldest temperature ever recorded in Klaipėda is −33.4 °C (−28.1 °F) in February 1956. The wettest month is November with a mean total precipitation 90 mm (3.5 inches). August through November is the wettest season because of the warmth of the Baltic sea in relation to the continent and the westerly winds. The driest month is February averaging 31 mm (1.2 in) of total precipitation. Spring is not particularly wet. The tallest building in Klaipėda is 34-storey Pilsotas. Klaipėda railway station (Lithuanian: Klaipėdos geležinkelio stotis) is located at Priestočio g. 1, north of the Old Town. Klaipėda railway station consists of two buildings. The old building, made of yellow bricks and reflecting features of Classicism architecture was built in 1881. Currently, the building hosts various small businesses. The railway station is located in the new building, built of red bricks in 1983. The railway network of then Prussia reached Klaipėda in 1878. Initially merely used for lumber and fish freight on Klaipėda–Šilutė, Klaipėda–Šilutė–Pagėgiai routes, the railway grid network of Lithuania Minor received a major boost after Klaipėda uprising and annexation of the region by Lithuania in 1923. As of 2017 Lithuanian Railways were operating two routes from Klaipėda railway station. 4 daily trains on route Klaipėda - Vilnius and 2 daily trains on the Klaipėda–Radviliškis routes. Train tickets could be obtained at the station, online at www.traukiniobilietas.lt or with a surcharge - on board the trains. Klaipėda is located next to Curonian Spit and a small part of the peninsula (Smiltynė) is within Klaipėda. People can reach the peninsula by ferry using one of the two terminals. The New ferry terminal (Nemuno st. 8) - ferry for people with motorized vehicles. Klaipėda's public transportation is based on geographical peculiarities. It is arranged by the north-south axis, based on three parallel principal streets, running along the coast of Curonian Lagoon and thus making the grid very logical and comfortable for commuting. It is possible to buy an electronic card in shops and newspaper stands (kiosks) and top it up with an appropriate amount of money. Public transport is organized, supervised and coordinated by Klaipėda city passenger transport. Buses to other cities and towns depart from Klaipėda bus station (Butkų Juzės g. 9). Buses to Curonian Spit villages Nida and Juodkrantė depart from a bus stop in Smiltynė (next to the Old ferry terminal). Domestic and international commercial scheduled airline services are provided by Palanga International Airport. The airport is connected with Klaipėda by a city bus. Klaipėda is also serviced by a small, privately run aerodrome with a focus on sports aviation and charter services. From Klaipėda there are three ferry lines and two ferry companies: DFDS Seaways and TT-Line. DFDS operates ferries to Kiel (Germany) and Karlshamn (Sweden). Ferries depart from the Central Klaipėda Terminal (CKT). TT-Line ferries are going to Trelleborg (Sweden). Klaipėda's Old Town is notable among other towns in Lithuania for its abundance of German and Scandinavian architecture. Klaipėda's Old Town is unique with its fachwerk architectural style and the planned street structure, which is uncharacteristic to any other old town in Lithuania. Its streets are geometrically configured very correctly, and the angle of intersection is always straight. One of most popular places in Klaipėda‘s old town is The Theatre Square. hosts a variety of concerts, the Sea Festival, the International Jazz Festival and other events. An important focus of the Theatre Square is the Taravos Anikė sculpture depicting a youthful barefoot girl. The sculpture was erected in the memory of the poet Simonas Dachas and perpetuates one of the poet’s described heroes. Look alike fachwerk style building "Old Mill hotel"
The remnants of the Klaipėda Castle, built in the 13th century by the Teutonic Order. It had a massive bulk and a quadrangular tower, surrounded by the ramparts and brick bastions. It lost importance after the Russian occupation from 1756 to 1762, and thenceforth started to decay. The Žardė ancient settlement, situated on the right bank of the Smiltelė River. It is dated to the late Iron Age (10th century), and was inhabited until the 16th century. The remnants of the so-called "Dutch" defence system around the entire town from the 17th–18th centuries. The maritime museum in Fort Wilhelm, built at the end of the 19th century at the spike of the Curonian Spit. Klaipėda youth theater "Klaipėdos jaunimo teatras"
The museum with 6 different exhibitions is set in a former nineteenth-century fortification of the Spit. In the Maritime Museum, there is a huge aquarium, the exhibitions of marine fauna, mammals and seabirds. The aquarium is populated with invertebrates, and freshwater fish of Lithuania – many species, not only from the Baltic Sea, but also from various tropical seas. The museum’s courtyard has a pool filled with seals, sea lions, and penguins. The marine fauna exhibition has diverse exhibits: mollusk shells, various fossils, algae and other special exhibits, surviving the prehistorical dinosaur times. Annual events include Klaipėda Music Spring, the Klaipėda Castle Jazz Festival, Museum Nights, the International Festival of Street Theatres, the International Short Film Festival, and the Klaipėda Sea Festival, among others. The Parbėg laivelis folk festival is held every two years. Klaipėda is famous for Švyturys brewery, established in 1784. Nowadays, Klaipėda is an industry, business, education and science, health, tourism and recreation, administrative center. Historically, Klaipėda is one of the most successful developing municipalities in the Western Lithuania. 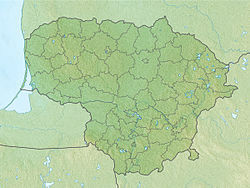 City generates approximately 12 percent of the country GDP and about 80 percent of the Western Lithuania. It is greatly influenced due to the Port of Klaipėda which is a very important transport hub. In the eastern part of the city there is Klaipėda Free Economic Zone offering 0 percent tax incentives for first 6 years, it is also the location of the first Geothermal Demonstration Plant in the Baltic States, which is supplying the city with geothermal heating and Fortum Klaipėda Combined Heat and Power Plant. In 2014, Klaipėda LNG FSRU with FSRU Independence ship was opened and guaranteed the alternative way of supplying the country with gas. Most of the city's GDP is generated in the service sector. Inhabitants of Klaipėda income is higher than average income of Lithuania. In the city there are such companies as Švyturys brewery, DFDS Lisco, Klaipėdos jūrų krovinių kompanija, Baltija Shipbuilding Yard, Vakaru Shipbuilding Yard, security company Argus, the largest cardboard and paper packaging processor in the Baltic States Grigeo Klaipėda, Balticum TV. According to the Lithuanian Department of Statistics, GDP in the second quarter of 2017, comparing with the first quarter of 2017, has increased by 7.7 percent, while comparing with the second quarter of 2016 it has increased by 4.0 percent. The rise is also planned in the further years. Since the 14th century Klaipėda became one of the most important education centers of the Lithuania minor. Klaipėda has 2 universities, 5 colleges. As well as schools of general education: elementary schools, middle schools, gymnasiums, pro gymnasiums. Baedeker, Karl. Northern Germany. London, 1904, p. 178. The Columbia Electronic Encyclopedia (2006). Gathorne-Hardy, Geoffrey Malcolm. A Short History of International Affairs, 1920 to 1934. Oxford University Press, 3rd impression, May 1936, p. 89/91. Encyclopædia Britannica 1938 Year Book. Woodward, E.L., Butler, Rohan, (editors). Documents on British Foreign Policy 1919–1939 (1939), Third Series, volume IV. HMSO, London, 1951. ^ "History of Klaipėda (Memel) | True Lithuania". www.TrueLithuania.com. Retrieved 4 November 2017. ^ "www.klaipedainfo.lt". Archived from the original on 11 March 2016. Retrieved 31 May 2015. ^ Klaipėda city information portal. "History Archived 2007-09-27 at the Wayback Machine". Retrieved 11 April 2006. ^ Magocsi, Paul Robert. Historical Atlas of Central Europe. University of Washington Press. Seattle, 2002. p. 41. ISBN 0-295-98146-6. ^ "Karalienės Luizės žingsnius primena medžiai ir pastatai". lrytas.lt (in Lithuanian). Retrieved 27 November 2015. ^ "Klaipėdos pašto rūmai (Liepų g. 16)". Uostas.info. Retrieved 15 February 2018. ^ EB, 1938 Year Book, see map of languages. ^ League of Nations Treaty Series, vol. 29, pp. 86–115. ^ Eidintas, Alfonsas; Vytautas Žalys; Alfred Erich Senn (1999). Ed. Edvardas Tuskenis (ed.). Lithuania in European Politics: The Years of the First Republic, 1918–1940 (Paperback ed.). New York: St. Martin's Press. p. 165. ISBN 0-312-22458-3. ^ Mažoji Lietuva.Klaipėdos krašto istorijos vingiuose Archived 2007-09-27 at the Wayback Machine. ^ Fosse, Marit; Fox, John (2016). Sean Lester: The Guardian of a Small Flickering Light. Rowman & Littlefield. p. 163. ISBN 9780761866114. ^ Tarybų Lietuvos enciklopedija. Vilnius: Vyr. enciklopedijų redakcija, 1986. T.2. P.325. ^ "Météo Climat stats for Klaipėda". Météo Climat. Retrieved 17 October 2017. ^ "Klaipeda Climate Normals 1961–1990". National Oceanic and Atmospheric Administration. Retrieved February 2, 2013. ^ "Klaipeda's Old Town – Explore the City". Retrieved 31 May 2015. ^ "Lithuanian Maritime Museum". Retrieved 3 August 2017. ^ "Biggest culture events in Klaipėda 2016-2018". Klaipėdos turizmo ir kultūros informacijos centras (Klaipėda Tourism and Culture Information Centre). Retrieved 3 August 2017. ^ "Jūros Šventė". JurosSvente.lt. Retrieved 10 November 2017. ^ "Klaipėda Castle Jazz festival". Jazz.lt (in Lithuanian). Retrieved 10 November 2017. ^ a b "Klaipėdos miesto savivaldybės administracija - Ekonominė situacija". www.klaipeda.lt (in Lithuanian). Archived from the original on 2017-11-11. Retrieved 11 November 2017. ^ Sėlenienė, Laura. "SGD terminalas oficialiai atidarytas: pradėjo suktis skaitiklis už "Independence" nuomą". 15min.lt. Retrieved 3 December 2014. ^ "Klaipėdos miesto savivaldybės administracija - Education". www.klaipeda.lt. Archived from the original on 2017-11-11. Retrieved 11 November 2017. ^ "Klaipėdos miesto savivaldybės administracija - Švietimas". www.klaipeda.lt. Retrieved 11 November 2017. ^ "Klaipėda State University of Applied Sciences". www.kvk.lt. Retrieved 11 November 2017. ^ "Lithuanian Maritime Academy". www.lajm.lt. Retrieved 11 November 2017. ^ "University of Applied Social Sciences". www.smk.lt. Retrieved 11 November 2017. ^ "Klaipėdos verslo aukštoji mokykla, UAB". www.aikos.smm.lt (in Lithuanian). Retrieved 11 November 2017. ^ "Klaipėda County Ieva Simonaitytė Public Library". www.klavb.lt. Retrieved 11 November 2017. ^ "Klaipėda City Municipality Public Library". www.biblioteka.lt. Retrieved 11 November 2017. ^ P.C., Net. "Gdynia - International Gdynia - International co-operation of Gdynia". www.gdynia.pl. Archived from the original on 2016-10-19. ^ Hassinen, Raino. "Kotka – International co-operation: Twin Cities". City of Kotka. Retrieved 2013-10-22. ^ "Kontakty partnerskie Miasta Szczecin". Urząd Miasta Szczecin (in Polish). Archived from the original on 2012-08-18. Retrieved 2013-07-29. ^ infoplease.com, Retrieved 11 April 2006. Wikimedia Commons has media related to Klaipėda.